The historic tower of Gonbad Kavoos is an enormous decagon building with a conic roof located in a city by the same name in Golestan Province, northeast of Iran. Massive cylinder capped by a conical roof, the tower reaches 72 meters high (including the height of the platform) and is a majestic structure made of brick, with special technicalities and affects of art, related to the 4th century AH. While it is not the world's tallest brick tower (it is shorter than the St. Martin's Church in Landshut, Germany and Church of Our Lady, Bruges in Bruges, Belgium and Qutb Minar in Delhi, India) but it is still the world's tallest pure-brick tower. This structure which is located on a hillock amidst the grand park of Gonbad Kavoos city, is the tomb of Shams al-Ma’ali Qaboos ibne Voshmgir Ziyari. The circular plan, broken by 10 flanges, is 17 meters in diameter, and with 3 meter thick walls. It is a fortified building, constructed by strong elements, and consists of beautiful ornamental works in proportionate lines adorned with harmony. The said structure consists of three parts - foundation, the main building and the dome which is conical (reaching a height of 18 meters), rising to an elevation of 55 meters. The actual structure rests on a round base, two meter of which is above the ground, and the rest lies as an underground base. The tower was built on such a scientific and mathematical design that at the front of the tower, at an external circle, one can hear one's reflected echo. Built in 1006 CE upon the orders of the Ziyarid Amir Shams al-Ma’ali Qabus ibn Voshmgir it is located 3 kilometers north of the ancient city of Gorgan, from where the Ziyarid dynasty ruled. Legend has it that the Sultan's body was put in a glass coffin and was suspended from the ceiling of the tower. A Kufic inscription at the bottom of the tower reads: "This great monument was built for Amir Shams al-Ma'ali, Amir Qabus ibn Voshmgir, by his command, during his life, in the year 397 of the lunar calendar, and year 375 of the solar calendar." The inscription verifies that the tower was built as a tomb for the named Ziyarid ruler. The tower is artistically designed with ten triangular patterns at regular intervals. Two simple epigraphs in the cuneiform embossment script can be observed on the construction dating to 397 AH. The tower has been constructed of red brick, but this color has changed to a golden yellow, under effect of sun rays. Vaulted arches can be noted at the entrance of the tower and the interiors contain the earliest examples of Mugharnas decorative styles. Gonbad Kavoos Tower was registered as an Iranian national cultural heritage site in 1931. Today the restoration of the dome is an urgent matter, with humidity threatening many parts of the building. Recently, some restoration work was done in a general cleanup of the tower which included cleaning the area from natural moss and cleaning bird waste off of the walls. Best time to visit: No Limit, Spring is the best time. 3- Take a taxi to Gonbad-e Kāvus City.Distance from Tehran to Gonbad-e Kāvus is 485 km. The Gonbad Kavoos Tower is located in Gonbad Kavoos, the province of Golestan in Iran. It reaches 72 meters high (including the height of the platform) and is a majestic structure made of brick, with special technicalities and affects of art, related to the 4th century AH. . While it is not the world's tallest brick tower (it is shorter than the St. Martin's Church in Landshut, Germany and Church of Our Lady, Bruges in Bruges, Belgium and Qutb Minar in Delhi, India) but it is still the world's tallest pure-brick tower. This structure which is located on a hillock amidst the grand park of Gonbad Kavoos city, is the tomb of Shams al-Ma’ali Qaboos ibne Voshmgir Ziyari. The Tower is an enormous cylinder capped by a conical roof. The circular plan, broken by 10 flanges, is 17 meters in diameter, and with 3 meter thick walls. It is a fortified building, constructed by strong elements, and consists of beautiful ornamental works in proportionate lines adorned with harmony. The said structure consists of three parts - foundation, the main building and the dome which is conical (reaching a height of 18 meters), rising to an elevation of 55 meters. The actual structure rests on a round base, 2 m of which is above the ground, and the rest lies as an underground base. The Tower was built on such a scientific and mathematical design that at the front of the Tower, at an external circle, one can hear one's reflected echo. Built in 1006 AD upon the orders of the Ziyarid Amir Shams al-Ma’ali Qabus ibn Voshmgir it is located 3 kilometers north of the ancient city of Gorgan, from where the Ziyarid dynasty ruled. Legend has it that the Sultan's body was put in a glass coffin and was suspended from the ceiling of the tower. A Kufic inscription at the bottom of the tower reads: "This great monument, was built for Amir Shams al-Ma'ali, Amir Qabus ibn Voshmgir, by his command, during his life, in the year 397 of the lunar calendar, and year 375 of the solar calendar." The inscription verifies that the tower was built as a tomb for the named Ziyarid ruler. Gonbad Kavoos Tower was registered as an Iranian national cultural heritage site in 1931. Today the restoration of the dome is an urgent matter, with humidity threatening many parts of the building. By 2007 much had been done in a general cleanup of the Tower which included cleaning the area from natural moss and cleaning bird waste off of the walls. The tower is a beautiful brick structure belonging to 4th century AH. It is located on a hillock inside the grand park of Gonbad Kavous city. It is the tomb of Shams-ol-Ma’ali Qabous Ibn Voshmgir Ziyari, the ruler of the times in Gorgan and a famed scholar as well. The tower is a fortified building and consists of beautiful ornamental works in proportionate lines. It consists of three parts: foundation, the main building and the dome. The actual structure rests on a round base, 2 meters of which are above the ground and the rest lies as an underground base. The city of Gonbad-e Kavoos is situated in the northern region of Golestan Province. This city neighbors the Turkmenistan Republic from the north; the cities of Aliabad, Aaq Qalaa and Gorgan from the west; the cities of Kalaaleh and Minoudasht from the east; and the cities of Raamian and Azadshahr from the south. This city covers mountainous regions and plains. The climate of this city round the altitudes of Azadshahr and Raamian is mild. The annual rainfall in this city drops from south to north and from east to west. The population of the city of Gonbad-e Kavoos consists of Turkmens, Azari immigrants, and ethnicities from Khorasan, Semnan, and Sistan-Baluchestan. The economic mainstay of the people of this region is animal husbandry and agriculture and the important agricultural products of this city include wheat, barley, and oil seeds. Also there are a number of active factories in this city, producing flour, oil, and canned food. The important handicrafts of the residents of this city include carpet-weaving, needlework, and production of ornaments. Also, horse-breeding is common in this region and the thoroughbred Turkmen horses are famous worldwide. The current city of Gonbad-e Kavoos was founded in 1926. It is situated in northern Iran and is 493 kilometers from the city of Tehran. The majority of the residents of this city are Turkmens. This city is located in a plain and it has relatively warm summers and mild winters. This city is located 45 meters above the sea level. It maintains one of the best designs for urban development. The ancient city of Gonbad-e Kavoos was one of the developed cities in the pre-Islamic era and maintained a special grandeur in the 3rd and 4th Centuries AH. This ancient city was razed to the ground during the attacks of Mongols, such that after the termination of these ruthless attacks, it did not manage to restore its previous grandeur. 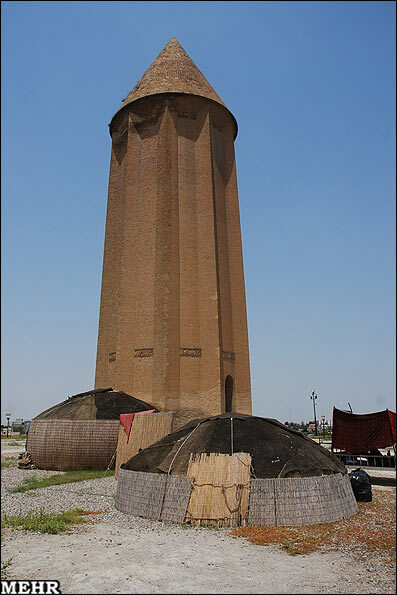 The current city of Gonbad-e Kavoos is of paramount important due to presence of the Qaaboos Tower in this city, which even the barbaric Mongol attackers decided not to destroy. The other ancient monuments of this city include the Holy Shrine of Imamzadeh Yahya ibn-e Zayd, and the ruins of ancient city of Jorjaan. There are also a number of marshlands in the environs of this city that are the habitats of migrating birds and are highly attractive destinations for the eco-tourists. One of the other tourist attractions are the horse-riding competitions, which are regularly held in this city. Qaaboos Tower is located at the heart of Gonbad-e Kavoos over a hill. It is recognized as the largest brick-made ancient tower in the world. This tower has been admired for more than a thousand years in Iran and by other nations across the world and has been praised by researchers and tourists, both. The Western Iranologist, Professor Arthur Upham Pope, in his book: "Iranian Architecture" has referred to this historical monument, pointing out that: "On the eastern foothills of Alborz Mountain Range and in front of the wide deserts of Asia, stands one of the major feats of Iranian architecture with a particular grandeur and beauty. This historical monument is Qaaboos Tower." This brick-made tower is one of the tallest historical monuments of Iran's Islamic architecture, with an altitude of 55 meters. It is situated over a hill, which is 15 meters in height. It has been built by the most famous ruler of the Aale Ziar Dynasty, Qaaboos ibn-e Voshmgir, in 1007 AD. Throughout the rule of this dynasty in 4th Century AH, the architecture of buildings in Iran was a blend of Khorasani and Raazi styles. The Khorasani architectural style is considered as the first Islamic-Iranian architectural style, which was common during a period of time between the 1stCentury AH to 4th Century AH. One of the features of this architectural style is the simplicity of its related buildings. The Raazi architectural style became common as of the4th Century AH and continued until the attack of Mongol ruler, Genghis, in 606 AH. In this period of time, the delicate Iranian architecture reached its peak. One of the features of this architectural style is the use of best-quality bricks, which maintained a high level of solidity and were resistant to rainfalls and scorching heat. This tower maintained a spiritual aspect and was a sign of an original and deep-rooted culture. It also guided the convoys, which passed by it. The inner design of this tower is circular and on the façade of this tower, inscriptions has been installed in every corner. These inscriptions have surrounded this tower and provide information about the construction of this historical monument. Over this tower, lies an 18-meter cone which is in fact the roof of this tower. In the southern corner of this tower, there exists a gateway which is 1.5 meters in width and 5.5 meters in height. It is noteworthy that this tower has remained undamaged for over a thousand years and has been named by the best global architects as one of the best-designed architectural feats of the world. This tower was enlisted among UNESCO's historical works and was globally registered in September 2012.